When it comes to Kanye West, it’s best to expect the unexpected. Shortly after dropping the excellent Yeezus out of nowhere last summer, he’s already dishing up new material despite getting married, working on his fashion line, and doing court-ordered community service. That’s right. 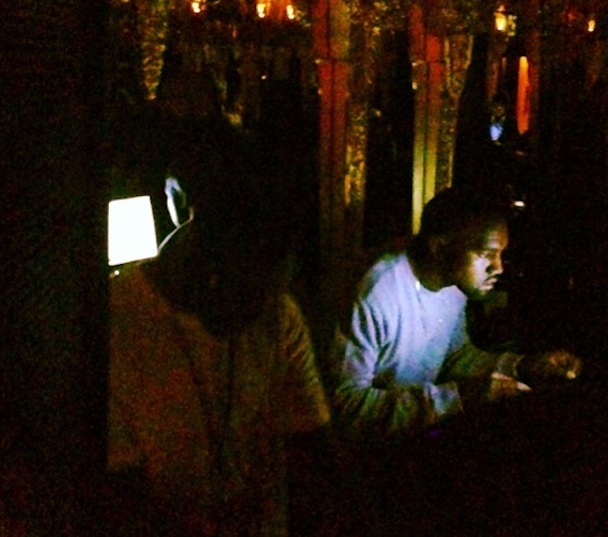 After London’s Wireless festival last night, Kanye and consigliere Virgil Abloh manned a London club’s DJ booth where he supposedly spun new material. According to Complex and several eyewitness Twitter accounts, they played around 20 new songs. People described it as “dark,” “hellish,” and (surprise) “groundshaking.” Who knows if the songs are bound and ready to be burned or if Kanye was testing the waters with early material. We still wish his invite to James Blake to work on the new record was taken up. No matter what the answer is though, months worth of preparation could never prepare us for the result (although he did say he wanted to drop new material this summer). WAS BLESSED TO HEAR KANYE WEST’S NEW MUSIC PLAYED BY HIMSELF AT A PRIVATE LOCATION LASTNIGHT.